In 1997, NASA scientists did something pretty amazing. For the first time, they used a small wheeled robot to study the surface of Mars. 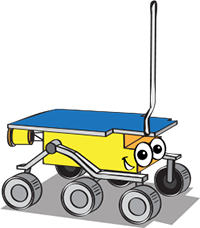 This robotic explorer, called a rover, was named Sojourner. She was only about the size of a microwave oven. However, she went on to share lots of important new information with scientists. 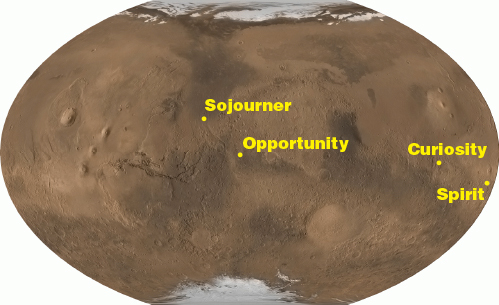 Sojourner wasn’t alone on her journey to Mars. She traveled within a spacecraft called a lander. The lander was shaped like a pyramid and was covered in airbags. The airbags helped the lander have a safe, bouncy landing. 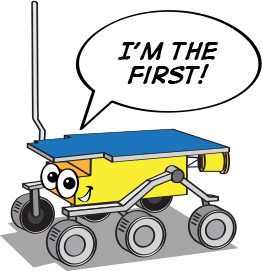 The pyramid shape helped ensure the lander and rover could be flipped right-side-up, no matter how they landed. 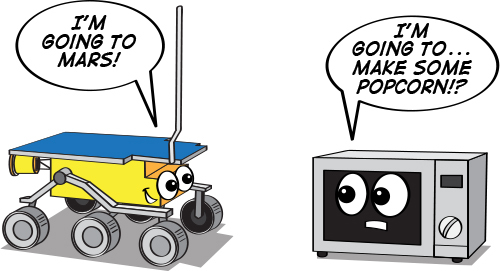 After the lander touched down on Mars, a panel opened and Sojourner rolled out to start exploring. The rover explored an area of Mars near her landing site called Ares Vallis. Scientists were interested in this area because it looked like the site of an ancient flood. The rushing water of a flood would have pushed lots of rocks and dirt into one place. This means the rover could study lots of different types of rocks without traveling very far. Engineers also liked the area because it seemed like a flat, safe place for Sojourner to land. As she drove short distances, she used her camera to take pictures of the Martian landscape. She sent back more than 550 pictures of the Red Planet. The rover used instruments to study what the nearby Martian rocks and dirt were made of. Her lander also collected information about winds and other weather factors on Mars. 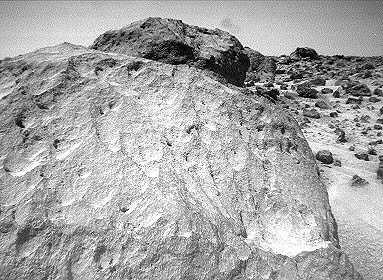 From far away, Mars looks cold, dry, and rocky. But Sojourner's photos and information told a much different story. We learned that a long time ago, Mars used to be a warmer and wetter place.